Detroit PAL is committed to offering increased opportunities for girls in youth sports. The Girls Changing the Game program aims to provide high quality programming for the girls Detroit PAL currently serves and to increase the number of girls that participate in Detroit PAL programs. 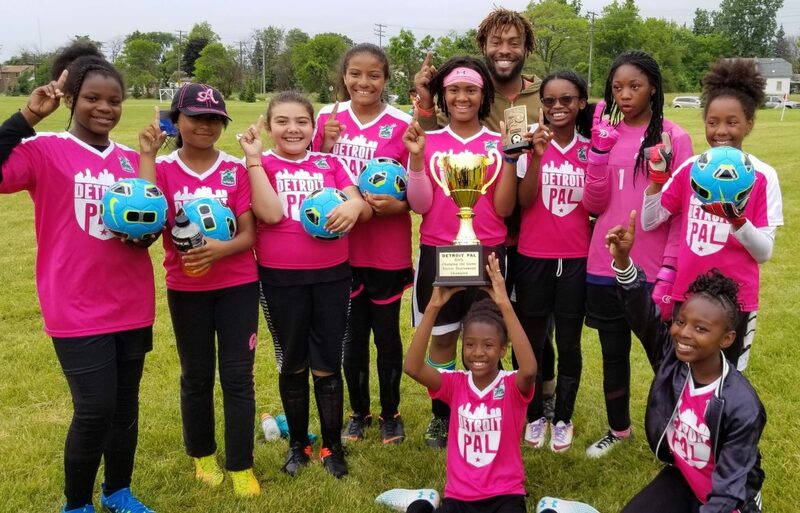 Saturday, June 10th marked the first all-girls soccer tournament in Detroit PAL history. The “Kick Like a Girl” soccer tournament consisted of four teams of female PAL participants in 3rd-6th grade. Four teams competed in this inaugural event: FLICS, Chrysler Elementary, Henry Ford Academy, and Hamilton Academy. Recent research shows that two-thirds of girls fail to get the minimal amount of activity required to maximize health benefits. Many girls, especially ones that are considered at risk, have a massive amount of barriers that prohibit them from being involved in any sort of physical activity. PAL will continually seek quality and engaging sports programs that best meet the need of today’s young girls with continual evaluation of the state of play regarding female youth. Congratulations to FLICS who defeated Chrysler 3-1 in the final!